The red sands of Mars are stained dark with the blood of conqueror and conquered, of explorer and savage beast, of alien and native alike. Mars, the Red Planet, named for some long-dead Earthling god of war, has lived up to its namesake. Armies march, archaeologists battle the traps of Ancient Ruins, and warbands of the native Chanari raid the towns of the 'civilized' castes with impunity. Life on Mars is one of conflict, of gun and blade, of bow and fang, of ideas. Freedom cry out the Julandri slaves, faith call back the Kastari priestly sects, mine scream the prince and the revolutionaries! 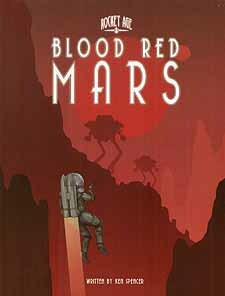 In Blood Red Mars you will find a complete gazetteer of the alien world, listing its major cities, principalities, physical features, and geographic regions, along with story hooks and example characters for each. There's also information and rules fore the (often-deadly) flora and fauna of Mars including the dreaded silt sea dragons, deadly stigia bird, and ravenous desert well tree; a list of organizations operating on Mars, each with detailed descriptions of their history, operations, and rules and story hooks for using them in the game; a complete adventure set on the Red Planet and more besides! Can our heroes prosper on Mars, or will their blood too soak into the sands eof th Red Planet?